Do you have stacks of partly used planners lying around that you tried and abandoned? Do you set new goals each year but you're lucky if they last until spring? Are you struggling to make permanent, positive changes in your life? 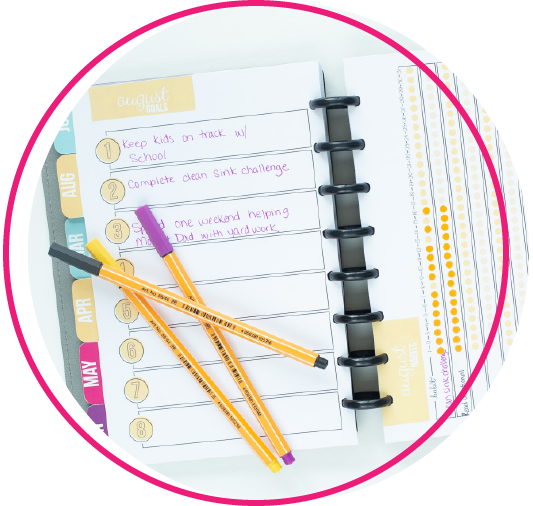 Do you want to craft a plan that sticks all year long and beyond? 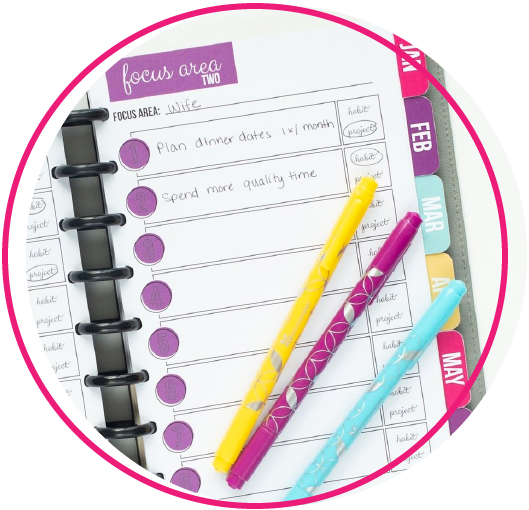 You know those planners that have us map out our life and goals down to the minute? Approximately 22 minutes into our day those plans have gone out the window! Here’s the thing: all that popular planning advice from the so-called gurus doesn’t actually work for us busy women, does it? If it did, I’m pretty sure you would have achieved all your goals by now. You probably think (just like I used to) that you’re just not trying hard enough or that you don't have enough self discipline. But that’s not true!! You just need the right information AND the right tools to create a planning system that sets you up for success instead of failure from the get-go. The good news is there’s a better way. It’s called the Sweet Life Planner. 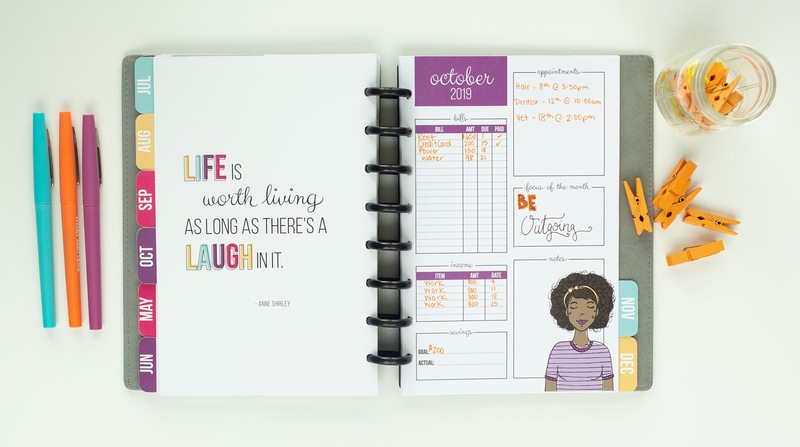 Every Sweet Life Planner comes with 12 monthly spreads, dated for 2019. 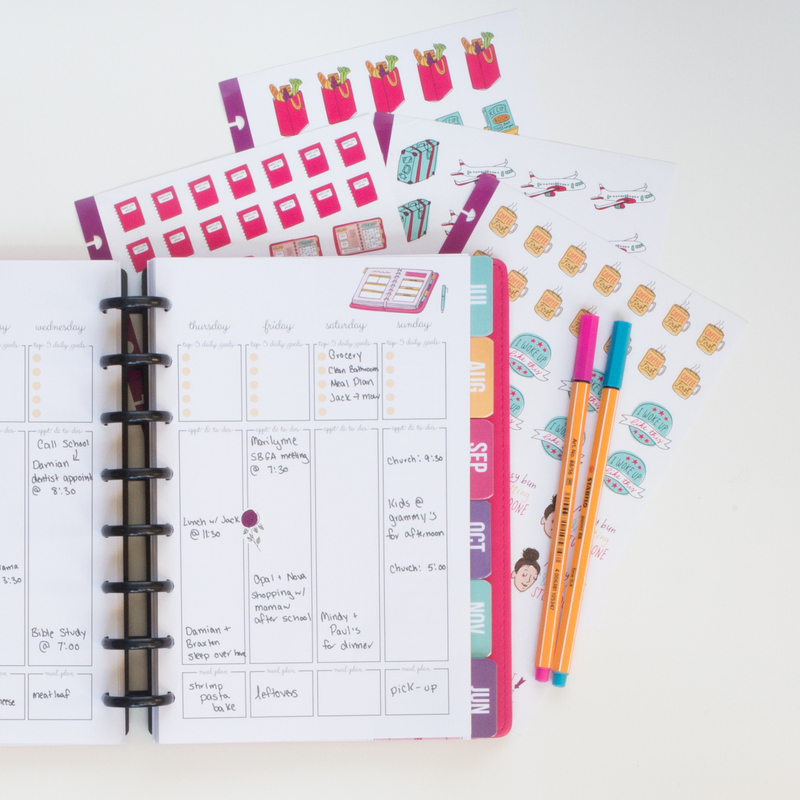 Your Sweet Life Planner includes two sticker sheets to jazz up your pages. A monthly goal page and habit tracker for accountability. Keep all of your extras in one handy place. A page to write to-do lists and reminders every day of the year. Cultivate thankfulness all year long with a space for gratitude each day. A mini goal setting workbook that helps you achieve your dreams. Make an action plan for spending and saving each month. A beautiful pink and white striped keepsake box for extra pages. See your weekly appointments and must-dos at a glance. Need a closer look? Click here for a virtual flip Through! 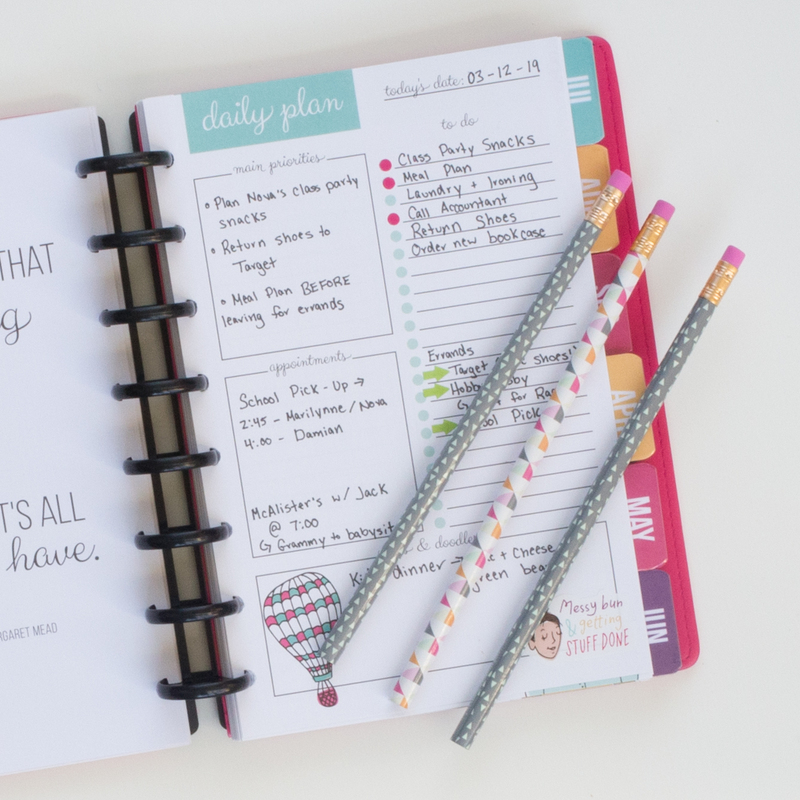 This planner checks ALL the boxes! How did we manage to accomplish all these things with a single planner? We used a flexible, disc binding system. It allows you to easily add, remove, or rearrange all the pages. 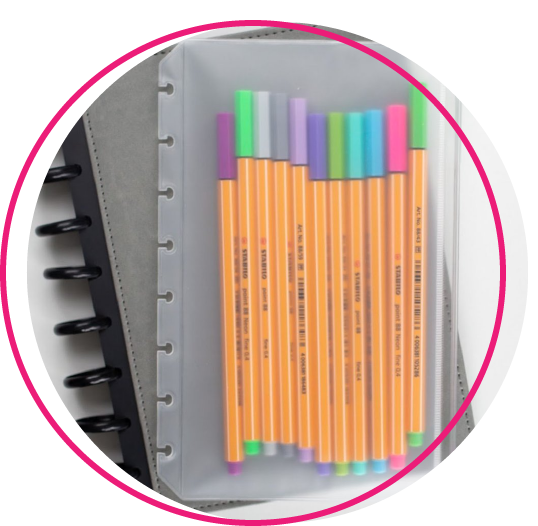 This system combines the best of a traditional 3 ring system with spiral binding. The disc binding doesn’t add much bulk and you can fold it back on itself like you can with spiral binding, but you can still move pages around. soon as you receive it! Do you want daily pages for each month? No problem! ​Do you want them all at the end? You can do that, too. Need extra note pages? Put them wherever you want. 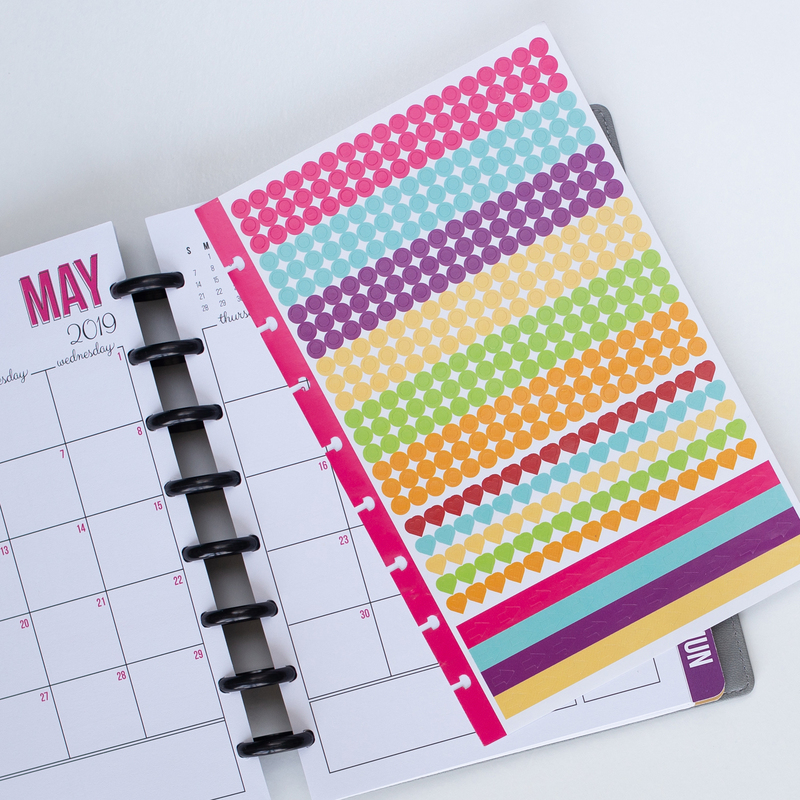 What you’ll hold in your hand when you get your planner has been six long years in the making! 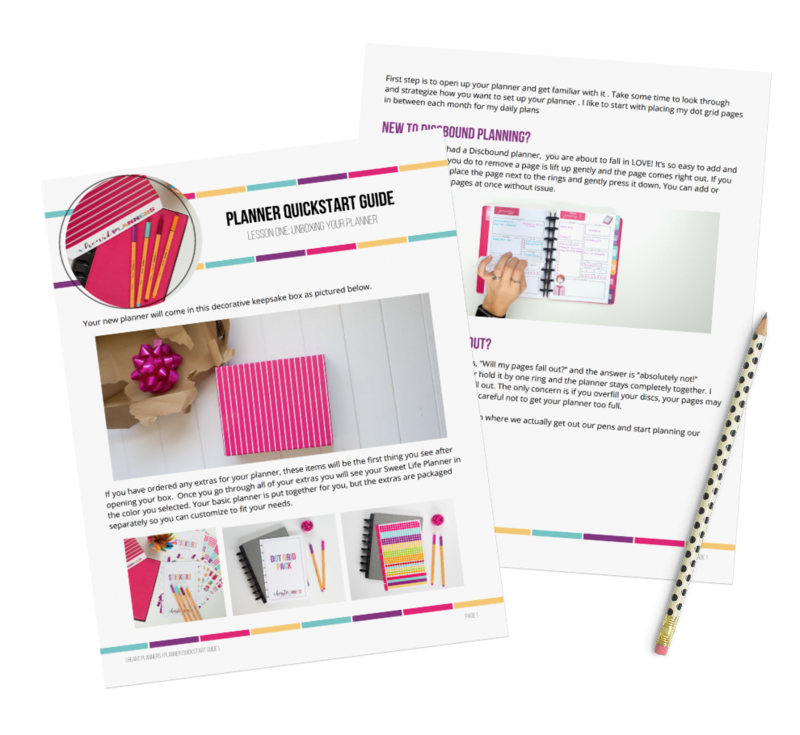 Hey, my name is Laura and I’m known for creating pretty printables. 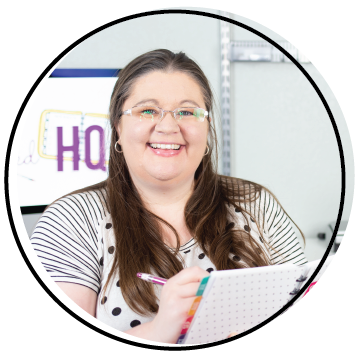 My website is called I Heart Planners, so, naturally, I’ve been asked literally hundreds of times to create a physical, mailed to your door planner. 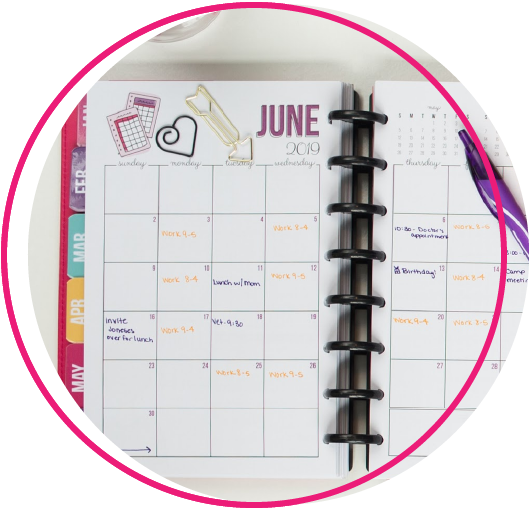 This planner was a dream of mine even before I started I Heart Planners six years ago, but here’s the thing: I didn’t want to create just any planner. I didn’t want to add just one more choice among the many planners out there. I wanted something COMPLETELY different. I wanted an absolute dream planner that checked ALL the boxes on my planner wishlist, and I was not willing to settle for anything less. So you see...it’s been six years in the making. Q. I'm an empty nester, and I don't have a lot of activities to coordinate. Would this planner still help me? A: Yes, definitely! 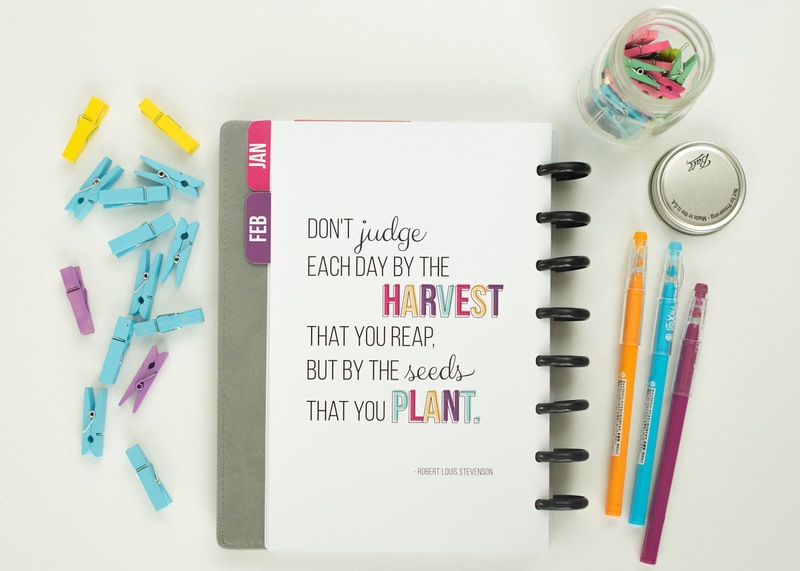 I think using a planner is just as important when there is less on your schedule. 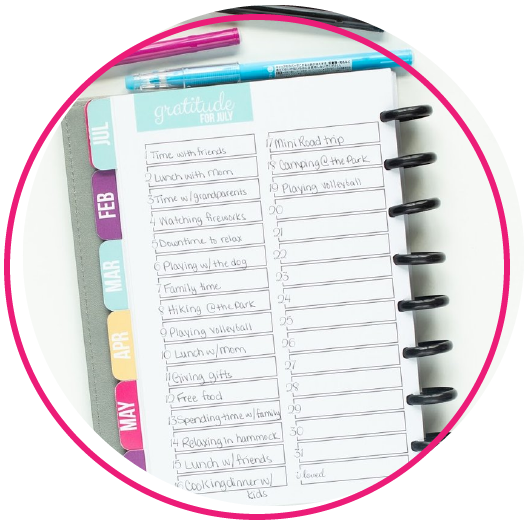 This planner doesn’t just help you keep track of appointments - it also helps you maintain your priorities and set goals. I’ve found that for me when I have less to get done, I tend to be less efficient, and I need my planner to help keep me productive. Q. I can't decide between the daily and the weekly layouts. Which is better? A: It’s really a matter of personal preference. If you have a whole lot of things you’d like to track on a daily basis, you definitely need the daily layout planner. 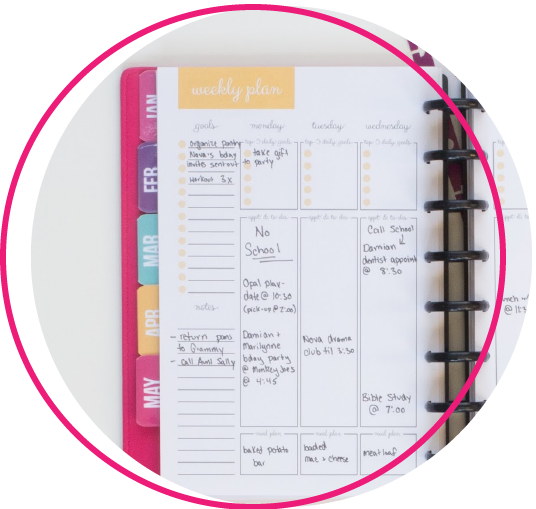 The weekly planner is for you mainly want to keep track of appointments and your very top priorities, but not your entire to do list each day. 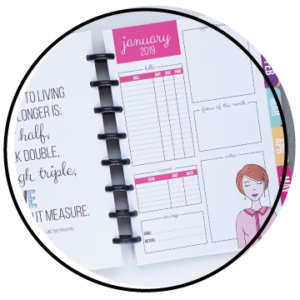 I personally use the page per day planner, and couldn’t live without it! 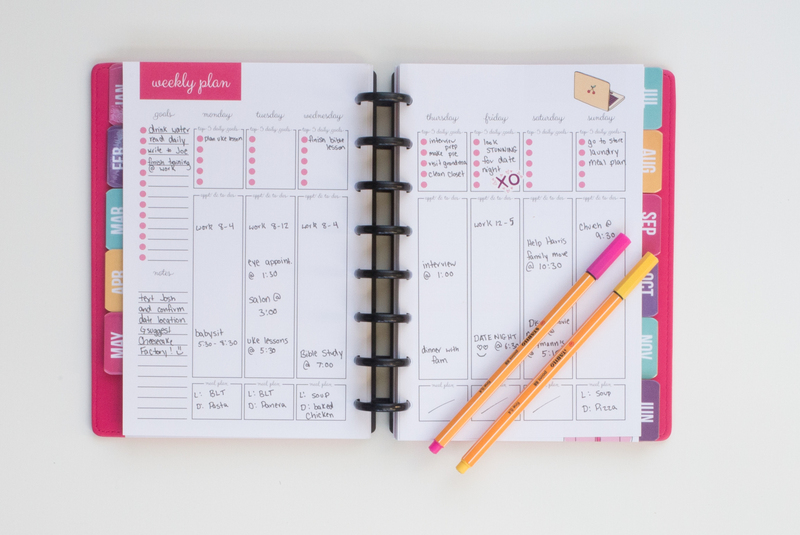 If you really can’t decide, you can buy the daily planner, and the add the week on 2 pages refill pack to go with it. Q. 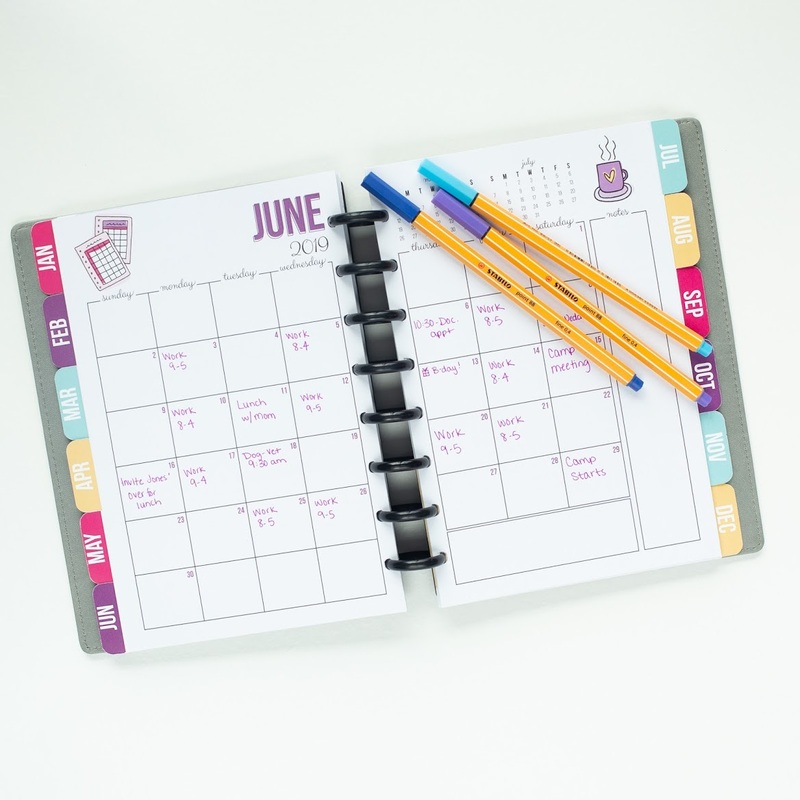 What is the BUJO planner? A: You’ll notice we have a bujo planner in our shop. “Bujo” is short for “bullet journaling”, which is a special type of planning where you only use blank grid pages and draw your entire planner yourself. 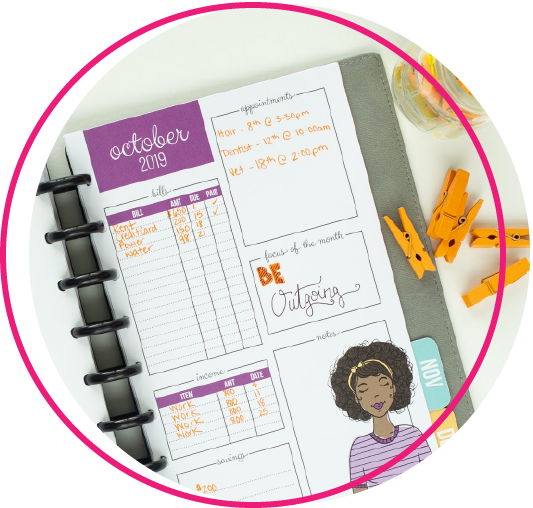 Our bujo planner is the first of its kind (which means you’re definitely not alone if you’ve never heard of such a thing), because it combines the convenience of a premade planner with the extreme flexibility of bullet journaling. 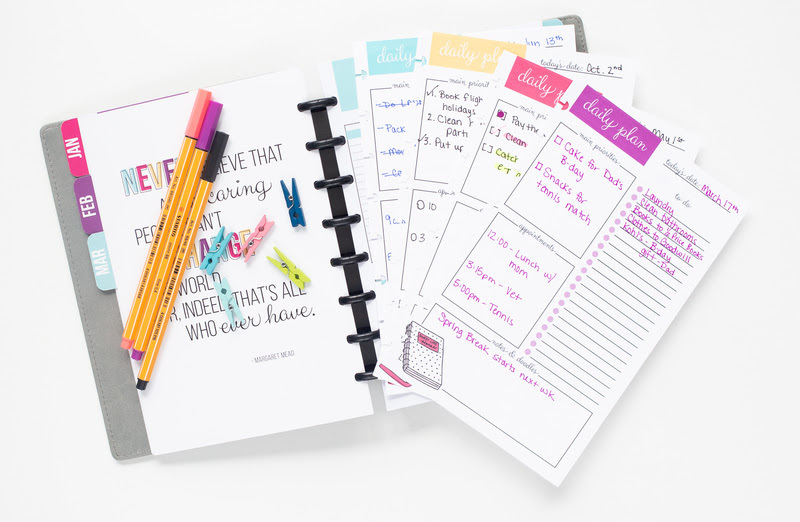 It contains all the core pages as our other planners (monthly tabs, monthly layouts, goal setting pages, habit trackers, gratitude journal, stickers, etc. 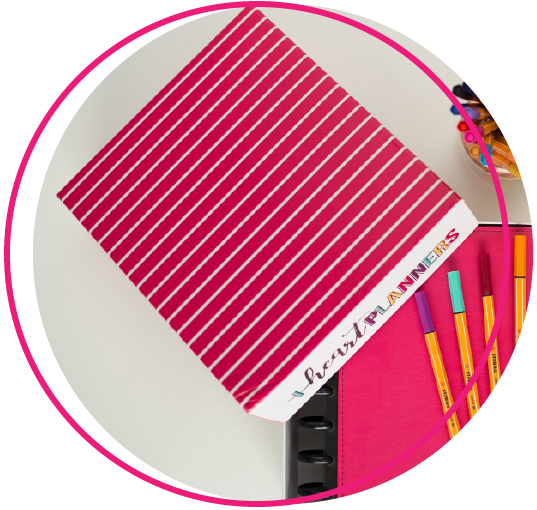 ), but has 100 dot grid pages for you to place between the months instead of a the daily or weekly layouts that come with those planners. Q. Is the planner really worth the investment? A: Your planner is a tool you’ll use EVERY single day to help keep you on track, so it’s definitely worth a little investment. When you do the math, you'll find it costs about 12 cents per day - less than a cup of nice coffee per month. That's more than worth it if you ask me. Q. I'm new to a discbound planner - do the pages fall out? A: I love introducing newbies to the disc binding system - it’s so different than anything else. I love how flexible it is - and the pages definitely don’t fall out. 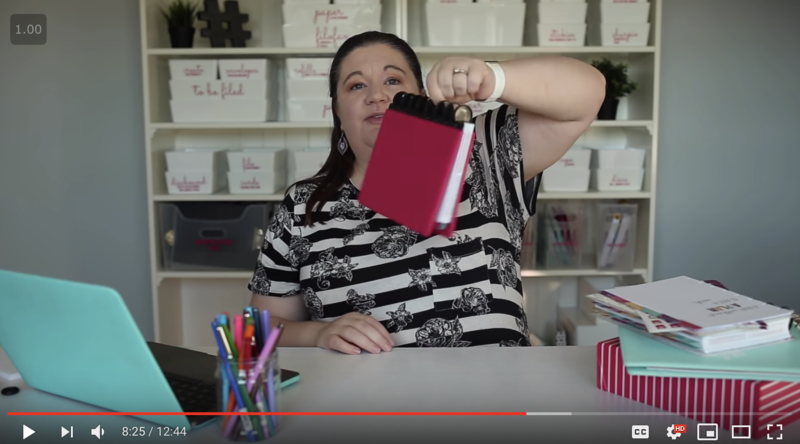 In this video I show myself holding the planner on its side by one disc and shaking it - still nothing falls out. Still unsure? Click here for a virtual flip Through! I just want to say, thank you for your awesome planner and I can't wait to start using it the beginning of the year. I've looked through it and it is absolutely amazing I can tell that you put your heart and soul into this project! I'm obsessed with this concept of being able to move pages around to make it customized to how you like it. And having blank pages to print on/write on/put anywhere is just plain cool! 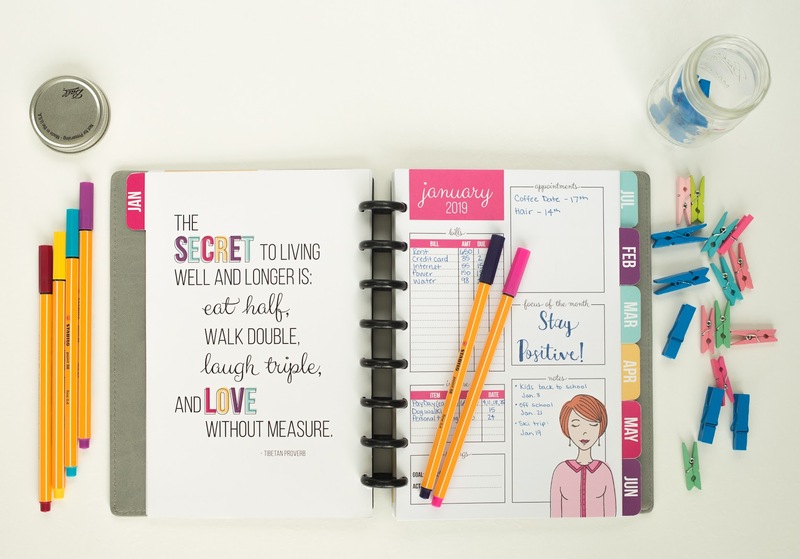 It combines everything I liked about the Happy Planner plus what I liked about traditional planners and MORE. I am BLOWN away with how amazing it is and even the packaging was incredible. The attention to detail is fabulous! Can NOT wait to start using it!! PSST . . . can I let you in on a little secret? I get it! I’m a busy woman like you, with a million loads of laundry, a budget to balance, and a business I run from home. eat off my floors at any given time. … but that’s just not true. Creating planning resources for my tribe keeps me inspired, it keeps my house (mostly) organized, and my budget in the green. There is no magic bullet. You have to do the work. BUT... I promise it will be worth it. You will see progress. Wait! I still haven't told you the best part. As a certified planner nerd myself, I have an astounding collection of different planners that I’ve tried. And some of them were so close to what I needed, but every single one was missing at least some page that I was dying to have. That’s why I’ve always known that my dream planner would be truly customizable. I wanted to change more than just the name on the cover. I wanted to be able to add, rearrange, and remove the pages inside the planner - easily. 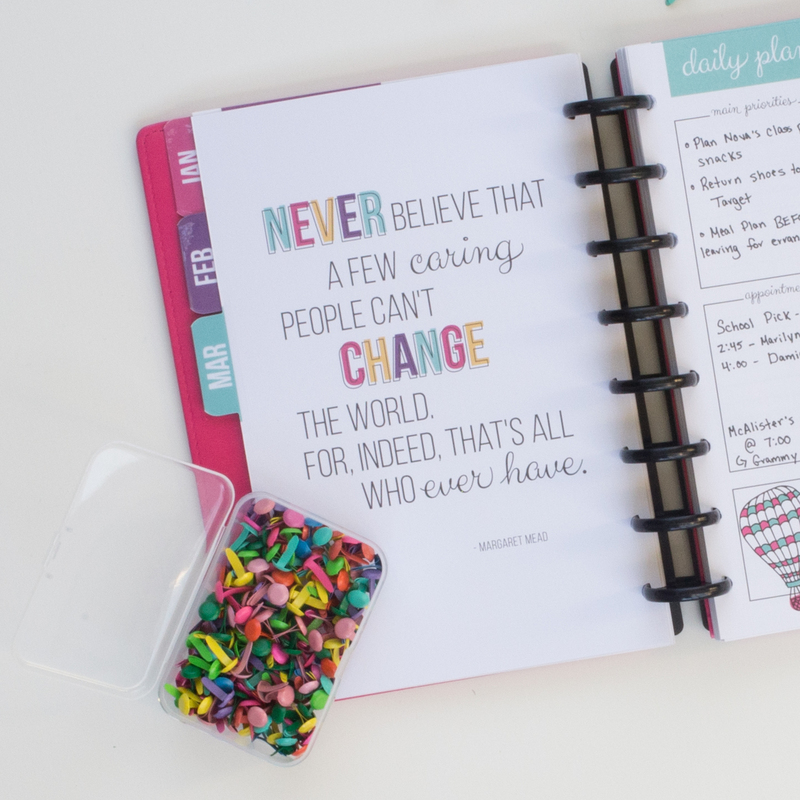 The disc binding system of the Sweet Life Planner allows just that. You can customize it to your heart's content! Thanks so much for sharing your time and talents to create an amazing business that allows people to have a way to create some order in our sometimes-crazy lives!! You are making a difference in mine and I can't thank you enough!! Got my Sweet Life planner in the mail today & started bawling when I looked through it. It's honestly perfect!! 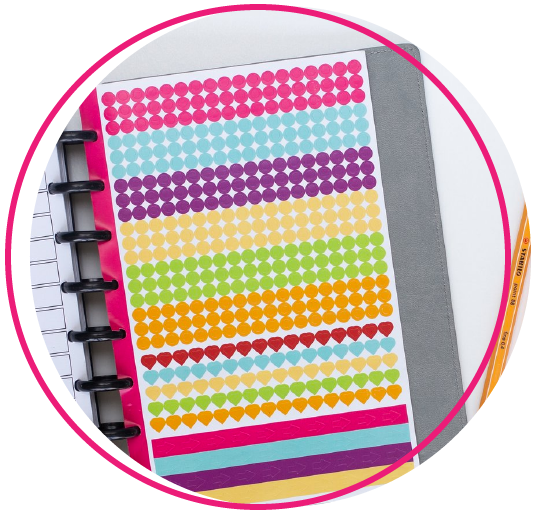 I loved my planner from Erin Condren but also love the Sweet Life Planner and prefer I Heart Planners because of the ability to rearrange! 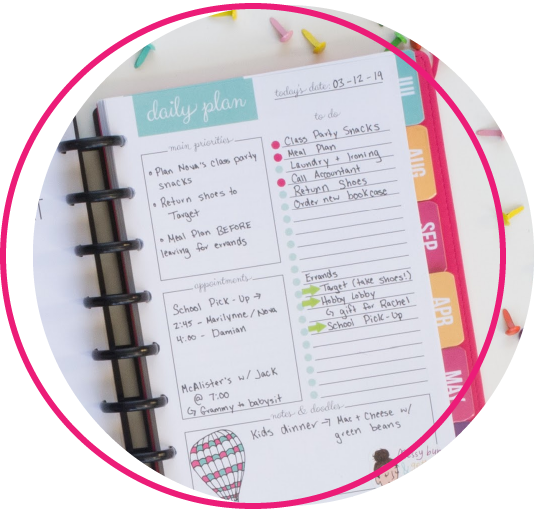 The Nitty Gritty Planner Details! *NOTE FOR INTERNATIONAL CUSTOMERS: We do ship internationally. We charge actual shipping costs calculated at checkout. Please note that you are responsible for any import taxes and fees (such as VAT) that apply in your location. For example, in most European countries, you will need to pay VAT fees when you receive your planner. Other locations have import taxes as well that you are responsible for. Something amazing is coming in 2020! Get on the waitlist so you don't miss a thing.